You may have heard that the W&L University Library is getting rid of our library catalog. Unlike so much of the fake news flying around these days, this tidbit is somewhat true. Our online catalog (aka “Annie”) will celebrate its 26th anniversary during the upcoming Thanksgiving break — and then we will bury it shortly after Christmas. In late December the contents of the catalog will be subsumed within a larger “discovery” database system and will continue to be available, but not as a separate listing. We will be sharing more about that new system over the coming weeks. 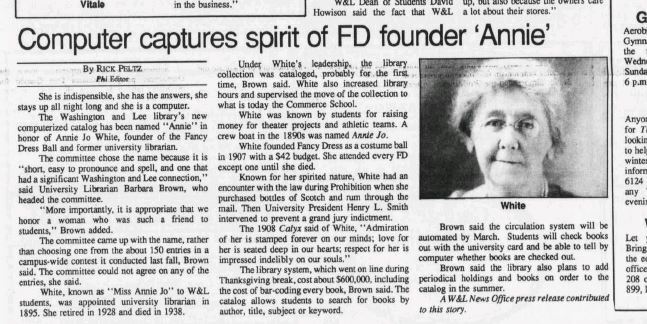 To get some idea of the impact of the arrival of Annie in 1991, see the 9 January 1992 Ring Tum Phi article, below. Requests for books, videos, or other materials needed for the start of Winter Term must be submitted by November 15. Links to the library catalog (such as this) in course syllabi or other online locations will not work after December 27.